If there’s one thing that might break your expat child’s heart (or yours), it’s leaving a cherished pet behind. But what should you consider before starting the process of bringing family pets into the US? And what hoops will they (and you) have to jump through before you both get the all-clear? The only pets I had back home were cows and chickens, and they’re not exactly the most acceptable of pets. Suffice to say, I haven’t been through the process of bringing any furry family members over to the US when I moved here from Australia. Speaking of furry family, my brothers don’t count, mostly because they haven’t visited me here. 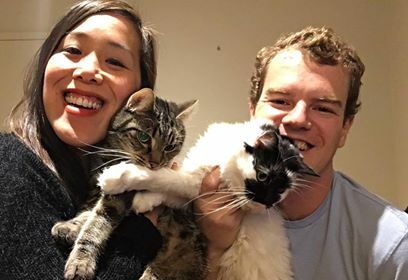 So for this blog I had to delve into the collective wisdom of the Australian community over in the US for their experiences with bringing family pets into the US. Some used dedicated pet-moving services to bring their dogs or cats to the US, while others brought them over themselves. Whichever way you’re thinking of doing the big move, there’s real-life experience for you to read about right here. But first, let’s talk about the US government restrictions and protocols. The US Center for Disease Control (CDC) has a few regulations that apply to any animal that is brought into the country – including those that have left and are returning. And while you might not need to present a health certificate for your pet to the CDC, one may be required by certain airlines or by some states. 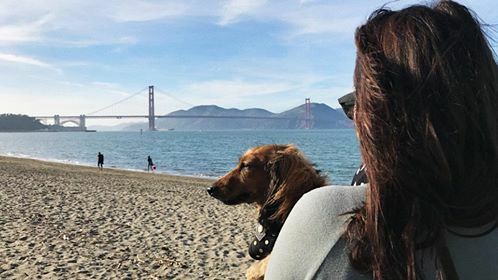 Aussie Tracey and her Dachshund enjoying San Francisco. Now that you know your lizard is welcome here, we can move onto the regulations for the most common pets. 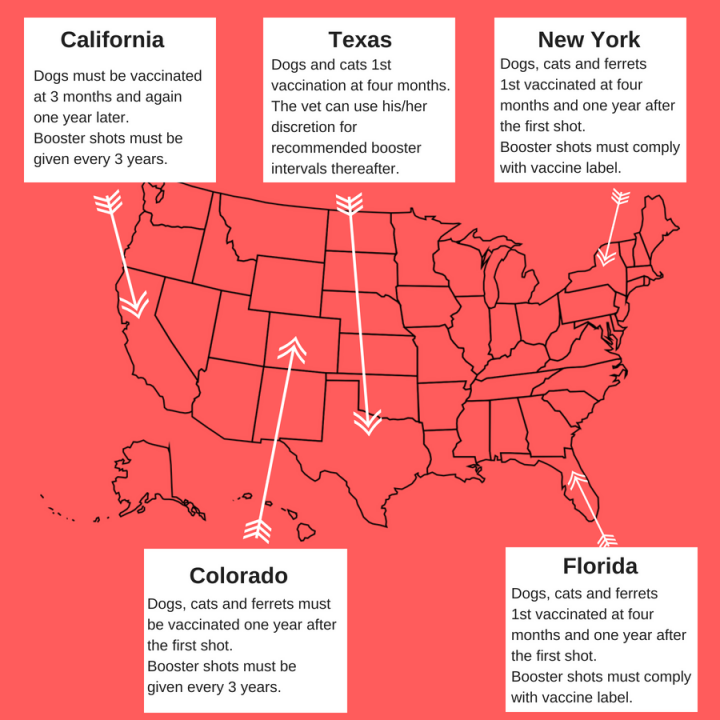 If your dog has lived in Australia for more than six months, or for its entire life, then you won’t need to have it immunized against rabies before entering the US (although it is wise to do so anyway). There is a list of countries that are accepted from the rabies immunization rule, which you can view here. With that being said, it is a good idea to get your dog and cat immunized to protect them from rabies. It’ll also be easier to take them back with you, should you return to Australia. You don’t need a health certificate for your dog or cat, but know that if your pet looks sick or sickly to officers when you enter the country, you might have to pay for it to be examined by a vet before it’s allowed into the US. 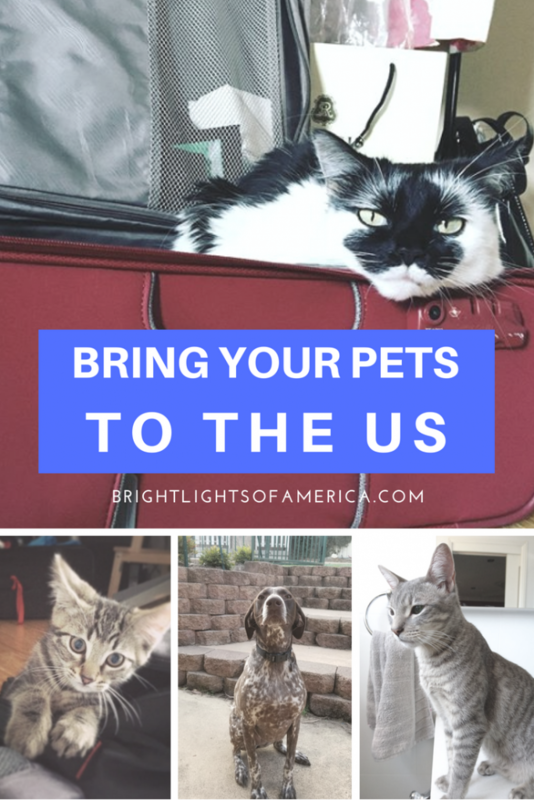 Even though the government restrictions aren’t that stringent, compared to what we’re used to in Australia at least, there are some things you should do before, during and after you decide on bringing your family pets to the US with you. 1. Visit an Approved Vet: Get your pet thoroughly checked out by an Australian Quarantine and Inspection Service vet before you leave and, if possible, get a signed and dated certificate of good health. It might come in handy if there are any questions at the other end of your trip. 2. Check the Airline: Some airlines have different requirements for allowing animals on board. Some smaller animals may be able to fly with you in the cabin for shorter flights and others will need to be put into the cargo hold. 3. Pet Carrier: If you’re sending your pet on its own, try to get it used to the assigned carrier, so that it’s not too stressed or worried about getting in on the day of departure. 4. Summer Months: Some US airlines won’t allow pets to be shipped between May and September because of the heat. Make sure you check this stipulation while planning, especially if you have connecting domestic flights within the US. Now that you’ve read through the important bits and pieces, it’s time to get into stories from Aussie pet owners who have made the trip over with their beloved animals and get a first-hand look at what the process is like. 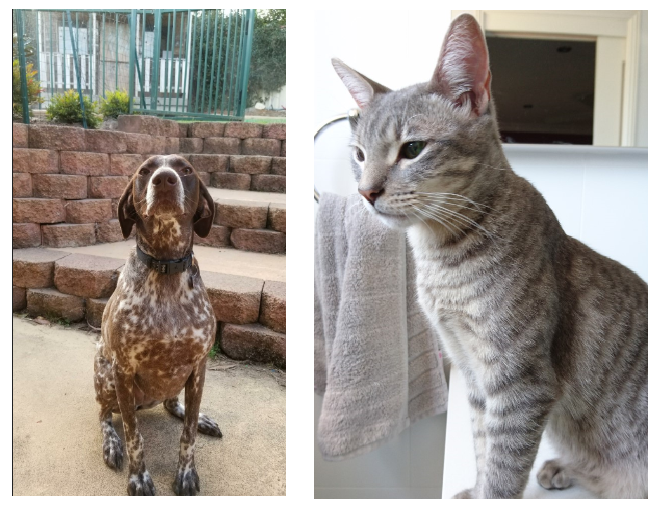 When Charmaine and her family decided to make the move to the US, she first consulted her vet about bringing German Shorthaired Pointer Abby and Domestic Shorthaired cat Ernie along for the ride. The vet recommended JetPets, and Charmaine was happy with the reviews so she booked the adorable pair with the service. Abby’s happy even though a giant Ernie seems to be looming to her right. 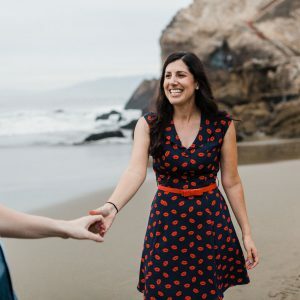 The couple decided to spend some time with their four children at Disneyland when they first arrived here, so Abby and Ernie were shipped over two weeks later. “If we hadn’t done this, Jetpets said they could get them on similar flights to us so they would arrive at the same time if we preferred,” Charmaine said. 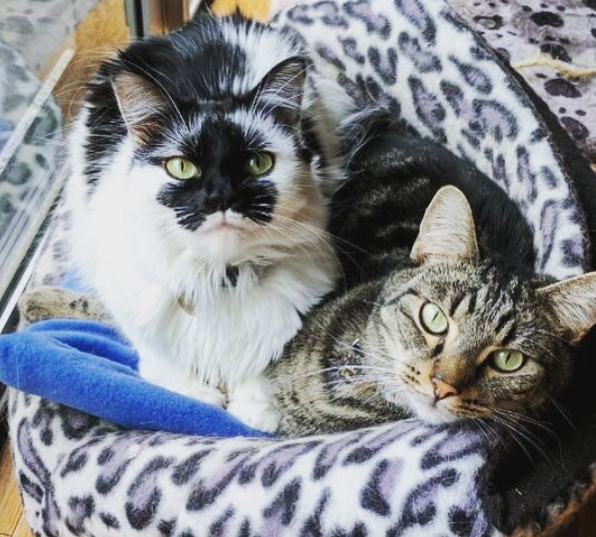 While Charmaine said that Abby and Ernie didn’t need any extra vaccinations, they were told that getting rabies immunizations each year would work in their favour when it came time to take their pets home to Australia again. It cost $4000 to bring the dog and cat to the US, but Charmaine said it was definitely worth the cost and that the pair settled in quickly. It seems that JetPets is a popular choice for Australians moving to the US. Leah used the company to bring her Daschund Barney over when he was 10-years-old. She highly-recommends the company (by the way, this post isn’t sponsored at all). While Barney has left us for the great farm in the sky, Leah said she would use the same service to move pets in the future, depending on their temperament. 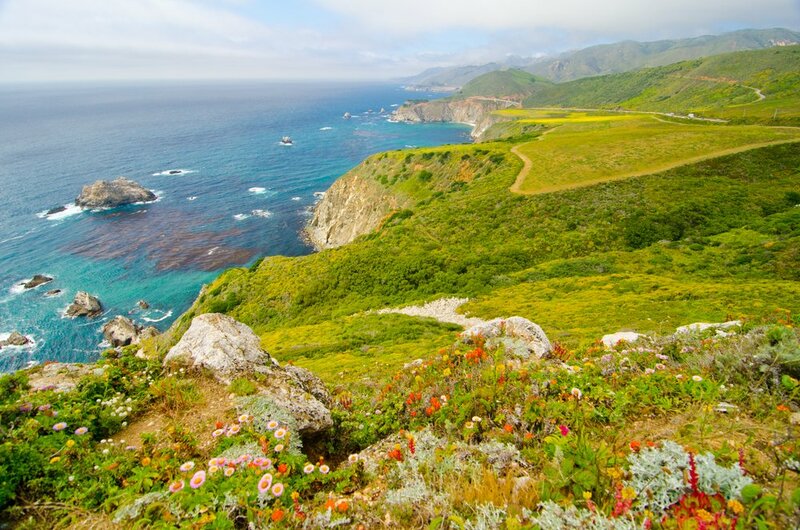 Gwen, who writes a great Aussie expat blog from the LA perspective called It Started In LA, moved to the US with her family and their 2-year-old Cavoodle, Cassie, five years ago. 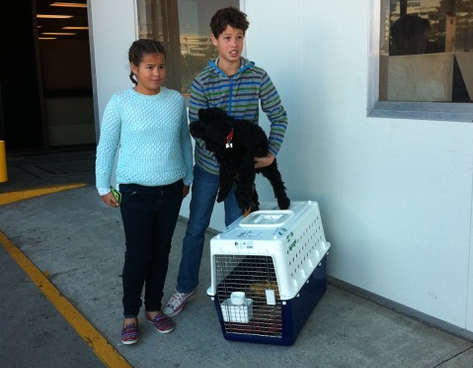 They settled on bringing Cassie along on the same Qantas flight as they were leaving Australia on, for peace of mind. Cassie and two of her best friends, ready for a flight to LA. “I decided to bring her myself because someone told me as long as I followed the steps it was easy to do, and the pet transport companies charge a lot of money,” Gwen said. Like the great researcher she is, Gwen got down to finding out exactly what was needed. She suggests visiting the Australian Department of Agriculture site but it also doesn’t hurt to check their US counterparts’ website for the complete run-down. Gwen was also assisted by the airline. Buy your pet carrier early and make sure it’s big enough for it to lie down, stand up and turn around in. Ensuring everything is good to go in that last 72 hours. It’s important to note that you have to go to an approved vet for the check ups, and your vet may not be on that list. 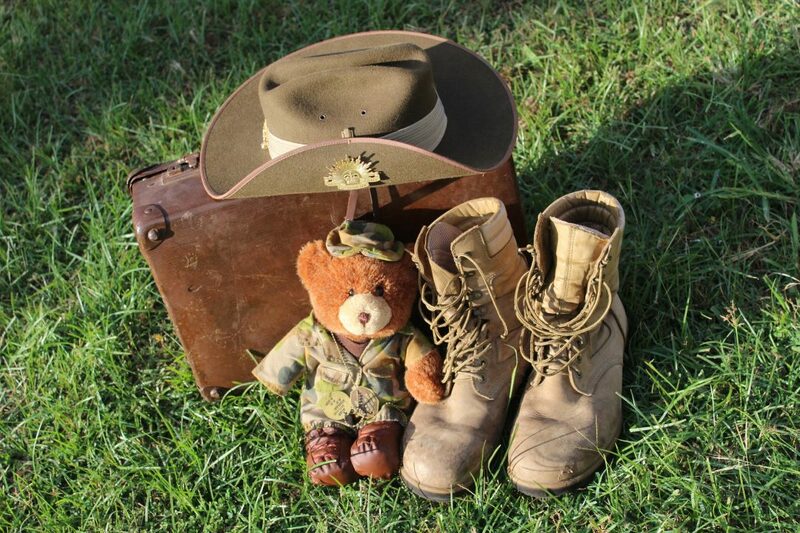 If you’re planning on bringing your pet back to Australia with you one day, make sure you follow the Australian Department of Agriculture‘s guidelines while you’re in the US. “I still make sure she has a regular rabies test and pay the exorbitant amount to ensure her title test is valid and the time she spends in quarantine is as short as possible,” Gwen said. Please welcome current Melbournite, and almost Bay Area resident, Kylie to the mix. She’s moving to San Francisco in a few weeks with her job, but she started looking into pet relocation in February. She and her husband couldn’t part with their two cats, Yoda and Luke, so they’re coming along for the adventure. Kylie and Rob with Luke and Yoda, who are also pictured in the main post image. 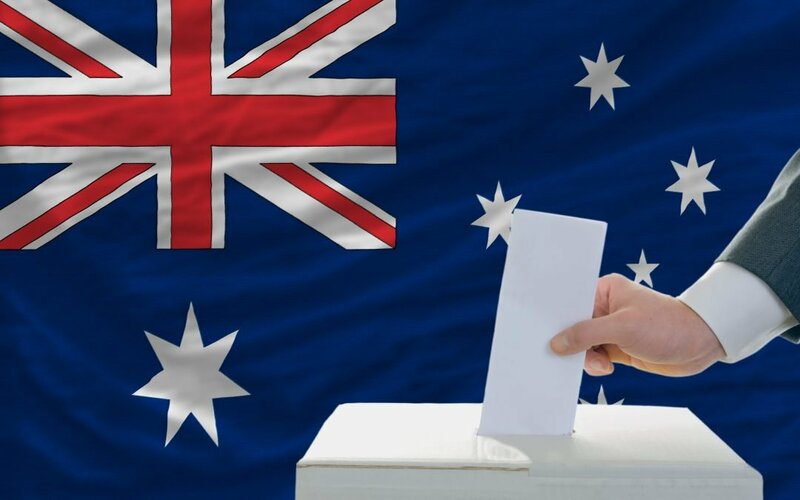 “My cousin is a vet and had advised I needed to get an AQIS vet (Australian Quarantine and Inspection Service) to vaccinate the cats and also get lots of paperwork ready so I was prepared,” Kylie said. I’ll let you Google RNA because I did and it got a tad confusing. Just know that the blood tests will cost a pretty penny, at $900. 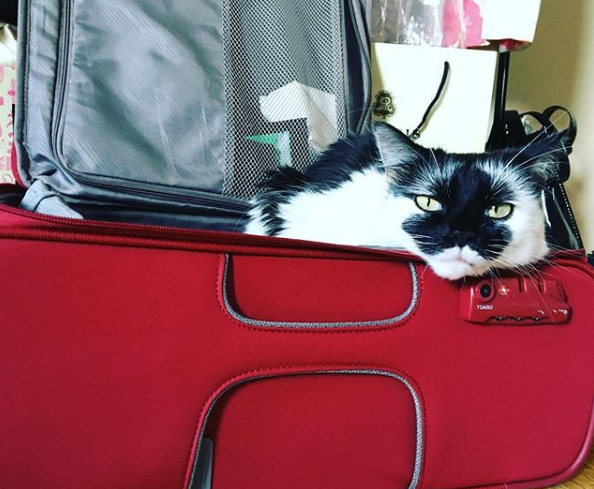 Kylie chose Petraveller to bring her cats tot he US, because of the overall customer service experience she had with the company and the results of her research. Meanwhile, Yoda here is ready for a trip to San Francisco. 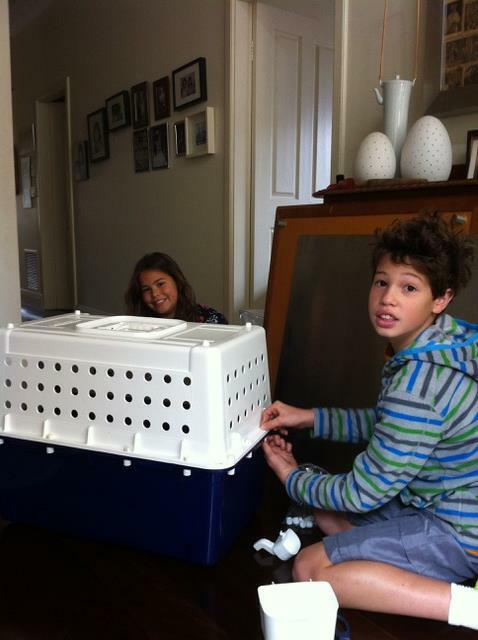 Yoda and Luke will leave Melbourne a day before their owners and will be delivered back to them a day after Kylie and her husband arrive in SF, to give them time to buy food and have everything ready for them in their new home.